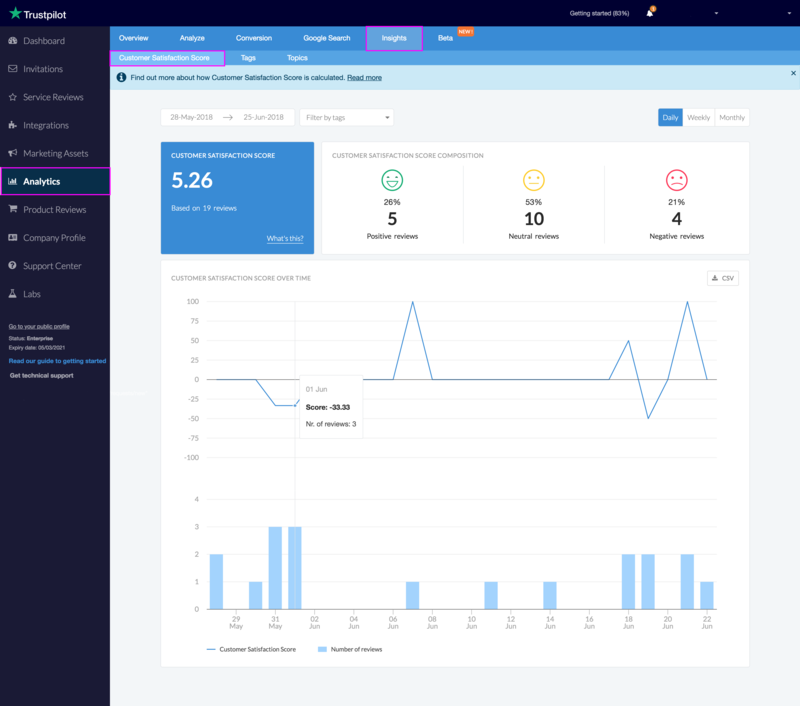 The Insights package includes a set of dashboards to help customers extract business insights from their reviews. The Customer Satisfaction Score is calculated by subtracting the percentage of Negative customers from the percentage who are Positive. Neutrals count towards the total number of respondents, thus decreasing the percentage of Positives and Negatives and pushing the Customer Satisfaction Score towards 0. Customer Satisfaction Score can range from a low of -100 (if every review is a Negative) to a high of 100 (if every review is a Positive). Add your own tags to your service reviews using Trustpilot’s Tagging and pre-tagging features. 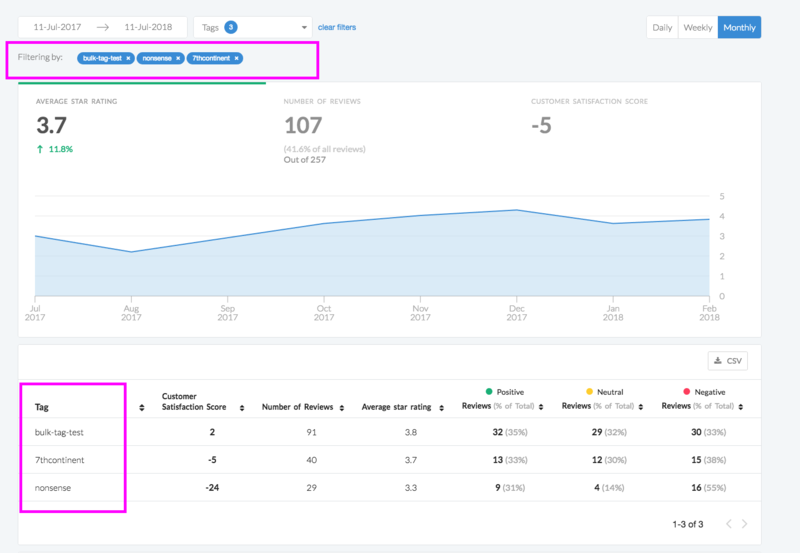 Once you’ve tagged your reviews, you can easily analyze your performance by segment and use the Tags Dashboard to monitor the most common themes in your service reviews. 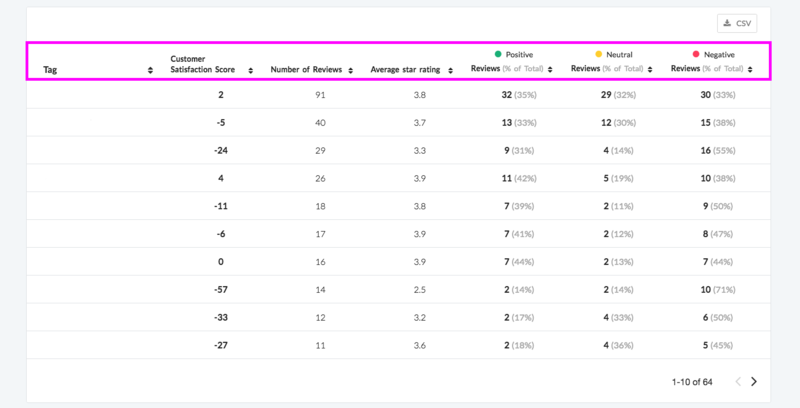 By default, the dashboard shows you aggregated statistics for all your tags, as well as an exportable table view that shows your average star rating, number of reviews, and customer satisfaction score for each available tag in the chosen period. If you want to have a closer look at how specific tags are performing, select them from the tags filter. The dashboard will display the stats for that selection. When you filter down to specific tags, you’ll also see a chart at the bottom of the dashboard that compare each tag’s average star rating over the chosen period. You refer to a 4 star review in this article as a 'neutral' review, and that when customers select this they are 'not enthusiastic' about the product or service. You acknowledge that 4 star reviews negatively affect a companies trustpilot score, by 'pushing the Customer Satisfaction Score towards 0'. Yet when a customer is given the options to review a business, a 4 star score is described by you as 'Great'. 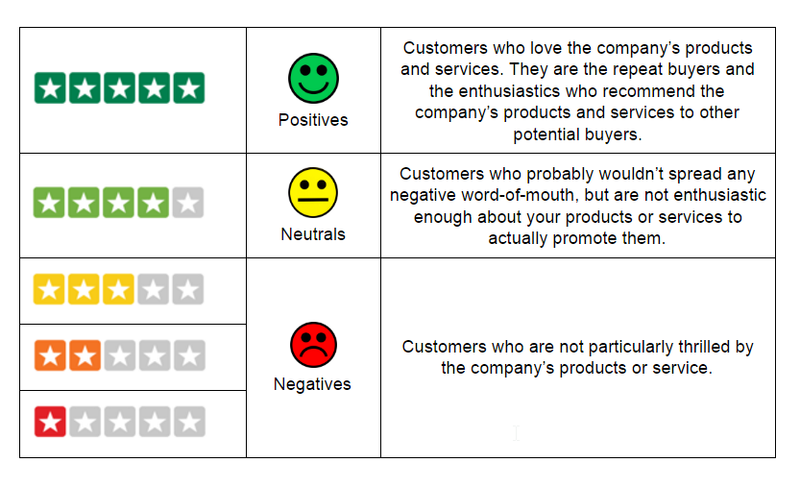 This is extremely misleading, and damages the reputations of companies whose customers leave such a review, when the intention of the customer is clearly to recommend the goods or service, and not to define them as 'neutral'. To imply that someone who refers to a service as 'great' is leaving a neutral review is laughable. Thanks for your comment. I completely understand your confusion. Hopefully, I can clarify it a little bit with this answer. I think you're referring to the section about the Customer Satisfaction Score. The CSS is an internal score business users can choose to add to give them an extra layer of insights to their profile. It has no impact on the online and public TrustScore. When counting the CSS we want to count the number of "promoters" - users that love a business - that the company has. Therefore, only 5-star reviews are used to calculate the Customer Satisfaction Score.